Allison Estergard is an acrylic painter living in Palmer, Alaska. She grew up in Oregon’s Willamette Valley and earned a degree in Fisheries and Wildlife Sciences at Oregon State University. She moved to Alaska in 2014 and began focusing on her artistic pursuits after realizing she could combine her appreciation and understanding of the natural world with the skills she had developed in drawing and painting courses. Her abstract paintings, which often focus on isolated features, are inspired by the Alaskan landscape. When out of the studio, Allison spends most of her free time hiking in the Talkeetna and Chugach Mountains with her husband and dog, Odo. She's also been known to snuggle up with her cat, Dax, and a good book. 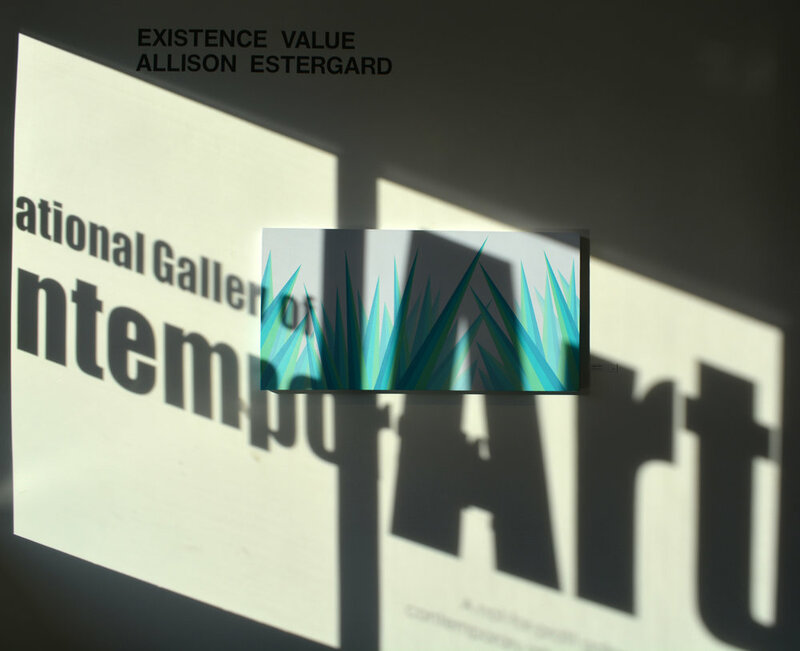 Allison's first solo exhibition was held in Anchorage, Alaska at International Gallery of Contemporary Art in February of 2017. I am drawn to nature because I find it humbling and it reminds me that I am only a small part of a much larger whole that connects us all. My acrylic paintings express that interest through the investigation of isolated components of the landscape. My abstract approach explores places and features that have great existence value and investigates humanity’s emotional connection to them using color and shape. My bachelor’s degree in Fisheries and Wildlife Sciences plays a major role in my subject choice as well as provides a foundation of knowledge about the landscape and natural processes. My current approach developed from a desire to remove spatial orientation and to focus on isolated features that explore my sense of space in Alaska. I began by identifying defining shapes for glaciers, ice, and snow, then simplified each until only the fundamental essence remained. I utilized soft lines to create flow and to represent the fluidity of water. I add dynamic energy through geometric shapes and clearly defined spaces. The vibrant color palettes represent my appreciation for these features as well as my emotional response to the subject. I find glaciers and snow to be ideal components of nature for me to explore through painting because they lend themselves to my style. The variety of forms found in decaying snowbanks and thawing glaciers inspire an infinite number of compositions. Crevasses and caves become experiments in depth through changes in color and value. As each aspect, and it’s defining shape, continually morphs, I draw endless inspiration for additional works. Each feature is in a constant state of flux and my continued study of them is driven by a desire to further develop my understanding of, and connection with, an ever-changing and disappearing feature. Each painting is an attempt to preserve the impermanent.